Bangalore: Many expected a fiery speech, instead they witnessed a fiery presentation. People had gathered at 1ShantiRoad Gallery for 'Art Attack in Tibet' presentation by Tibetan poet-activist Tenzin Tsundue on June 17, 2014. None seem to have disappointed as Tenzin Tsundue easily managed to entertain and also inform the gathering of Indian supporters of the Tibet cause and Members of Friends of Tibet with his audio-visual presentation. The Tibetan poet was introduced to the gathering in an informal welcome address by Shri Suresh Jayaram, an art critic and historian who has hosted several Friends of Tibet events in his beautiful gallery space situated at Shanti Nagar, Bangalore. 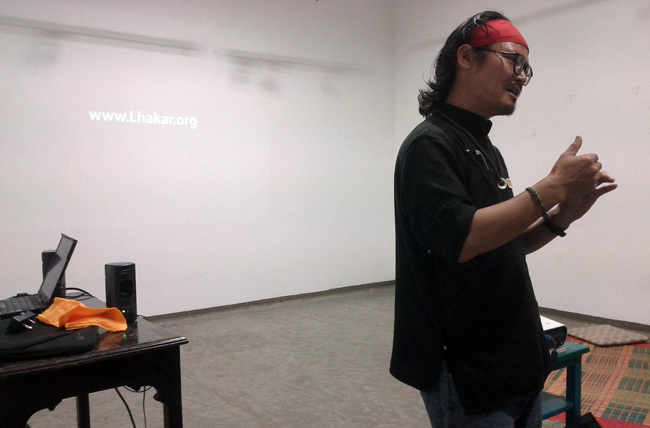 'Art Attack in Tibet', a meticulously prepared presentation by Tenzin Tsundue is all about "how a community back in occupied-Tibet watched and followed by the Chinese Secret Police used various forms of Art as the last form of communication with the adversary, when the obvious signs of protests are beaten to splinters and when all human language of dissent have blown away to dust". His revelation about how a society under strict vigilance and control managed to sing, paint, write and play to challenge the opaque brutality of the Chinese oppression even after 55 years of colonial occupation  similar to how the Jewish community responded creatively to the Nazi regime or how the Tamil community practiced Creative Resistance when their community had to undergo the suffering under the Sri Lankan military atrocities. The presentation which lasted for nearly one hour was in fact an eye-opener to a gathering of supporters and journalists, who always believed self-immolations are the only form of protest Tibetans inside are familiar with. In this context, Tsundue was able to introduce the new creative language of the arts attack inside Tibet with his "Art Attack in Tibet" presentation. Tsundue started his presentation by stating that "Art is the most powerful political weapon Tibetans inside occupied Tibet can use" while giving a brief about his intention behind "Art Attack in Tibet" presentation. "Not everyone can burn themselves", he reminded the gathering by telling them about 130 cases of self-immolations inside Tibet by ordinary Tibetans. He believed that it is only when an individual is left with no other option to fight the adversary, he or she is motivated to give away the precious life which he considers as one of the most sacred sacrifices for a nation. Tenzin Tsundue's personal collection of secretly-smuggled images from occupied Tibet included several shocking pictures of People's Liberation Army (PLA) soldiers with fire extinguishers and iron rods in case if they happen to witness a Tibetan protester on fire while roaming the streets of Lhasa. As a poet who's always been inspired by the life of a woman poet in his occupied country, Tenzin Tsundue introduced the courageous Tsering Woser, Tibetan blogger, poet and activist whose father happened to be a Communist revolutionary in the PLA. Born in Lhasa, Woser married a Han Chinese and later moved to Beijing in 2003 to avoid political repression back in Tibet. In spite of supression and repeated arrests, the woman poet-activist continues to write and speak against the military invasion of her beloved country  something people living in free nations do not dare to do. Time was the only limitation. Tenzin Tsundue had a long list of Tibetan poets, artists and singers who had risen against the mighty regime using their methods creatively. The case of Theurang, who was prosecuted in the year 2008 for publishing a powerful collection of poetry and essays titled "Shardungri" meaning "The Eastern Conch Mountains" was one among them. He described the enthusiasm and dedication of exile community back in India in re-printing and publishing these testimonials of poets from Tibet. "Intellectuals are the leaders of our struggle inside. They lead our nation without having political leaders," said an emotional Tsundue. "Today even the nomads are using the very same technology that the PLA uses to send images across to India, which is quite incredible," he said. He entertained the crowd by playing music videos of Yadhong, a popular Tibetan singer whose unique style of modern singing has attracted millions of admirers to his 'politically motivated' songs and music. With the help of visuals and videos, Tsundue also explained how Chinese government-sponsored cultural events present the "Tibetan idea of support in the most exotic Tibetan identity" and how cleverly Tibetans are using these platforms to send across their "political messages" to the rest of the world. But he was worried about how "Tibetan singers adopt and imitate what the Chinese singers are doing." Tenzin Tsundue also narrated examples of fighting the occupation forces in Tibet using creative methods and strategies. He gave Lhakar (White Wednesdays) for "self-reliance" or "Swadeshi" movement started after in the aftermath of the 2008 Tibetan uprising. This indigenous movement of the Tibetan people make special efforts to wear traditional Tibetan clothes, speak Tibetan language which is now the second language under occupation, eat only in Tibetan restaurants and buy only from Tibetan-owned businesses on Wednesdays, the Soul Day of His Holiness the Dalai Lama. The event concluded with a question-answer session with Tenzin Tsundue.